With Octoly, order the products of your choice on your Free Store directly and try them out! Once you have tested the product, you must post your review on your Octoly account at which point we will be notified, and the brand will be able to see your work! Not to mention, once you’ve posted your review on Octoly, you recover your credit that allows you to order a new product all over again. So, what are you waiting for? Get posting! Step 3: A window will appear that allows you to input the URL of your review. Don’t forget to timestamp your YouTube review! This is important so that brands can see all the hard work you put into your reviews. Please remember you can post a maximum of 5 Octoly products in Youtube videos, and 3 Octoly products for Instagram reviews. 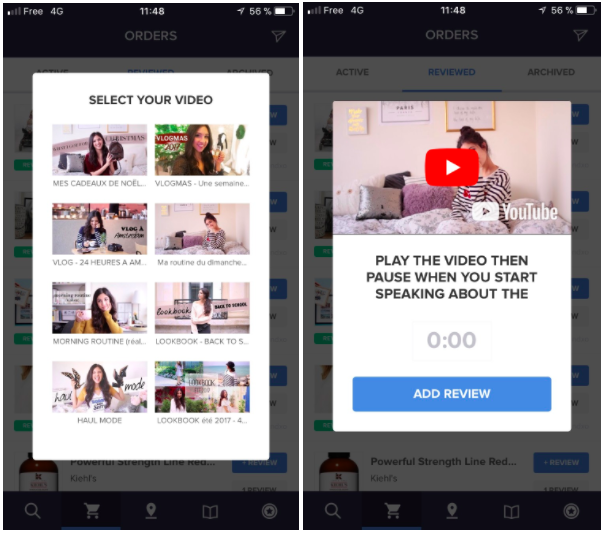 On the Octoly app, in the second tab "My Orders", you can choose your reviews directly by clicking on the YouTube videos that will be displayed when you click on “Add review”. To add a YouTube review, please remember to add a timecode so the brand can access the review of that specific product directly. To do so, simply play the video and pause it when you start speaking about the product. If your review doesn’t appear because it was in a previous post (only your 8 latest videos are displayed), simply post your review from a computer by copy-pasting the link of your review.